Far more than just a device able to make calls, send emails, play music, take pictures, and share those pictures on social media, cell phones are capable of amazing feats when paired with 3D printing. They can be turned into microscopes and other medical devices, and even be used to power a 3D printer. But another trend that’s picking up steam is using your smartphone as an actual 3D printer. Back in 2015, researchers from MIT were working to develop new algorithms that could harness polarized light from smartphones for 3D printing. That very same year, we first heard about the OLO (now called the ONO), the world’s first smartphone 3D printer. 2015 was clearly an important time for this type of work, as a professor of mechanical engineering at Taiwan Tech also created a smartphone-based 3D printer that year. In just about all of these cases, light emanating from the phone’s screen was used to cure resin, rather than using UV lights. So now it’s 2018 – what’s going on with smartphone 3D printers today? Specialist chemical manufacturer Photocentric, founded back in 2002 and specializing in visible light photopolymerization, manufactures the Liquid Crystal range of 3D printers and commercialized the first 3D printer based on an LCD screen two years ago. While 3D printing is used for both small-scale and large-scale manufacturing across many industries, Photocentric, which holds patents in visible light curing technologies, believes that the technology still costs too much to be adopted on a wide scale. That’s why the company is focused on using the LCD screens we interact with every day on our TVs, smartphones, laptops, and tablets to transform 3D printing and make it less expensive. To 3D print an object with resin-based 3D printers, the material is typically cured and hardened with a laser, or a digital light projector. But Photocentric is using LCD screen illumination to lower the cost of 3D printing, so that the technology can be used in more applications. The company, which employs 90 people at its Peterborough location, will reportedly have sales of over £7 million in the UK by the end of the year. Its US subsidiary in Arizona, which has 35 additional employees, should add to that sales number by £3 million. The company is certainly very ambitious and optimistic about its chances. “Our aim is to hit £100 million in 5 years and be the largest manufacturer of photopolymer for 3D printing in the world,” said Holt. Now, Photocentric is totally focused on powering 3D printing using the illumination from LCD screens, mostly from the visible part of the spectrum, which is required when it comes to visual display screens. This could be the future of industrial 3D printing someday. Photocentric founder Paul Holt with one of the company’s 3D printers. “Today it seems obvious that the highest resolution, largest format and lowest cost digital light source available is the visual display screen we all use in our pockets or on our walls,” said Paul Holt, the Founder of Photocentric. “But it can only work in 3D printing because our photopolymers can harden in light within the visible spectrum. In terms of making the technology more affordable, there are millions of LED screens manufactured by the electronics industry. It seems like nearly every quarter, cell phone, tablet, and TV screens change in size and affordability. If this industry takes its cue from Photocentric and focuses its R&D efforts on using these screens for 3D printing, the technology will inevitably become less expensive. 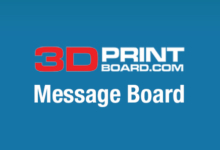 However, don’t expect to use your cell phone’s LCD screen to make large 3D printed objects. Regardless of how ingenious the idea is, the light output will likely be pretty low, and not enough to fabricate big parts. But it could be helpful when 3D printing lots of smaller objects. Photocentric research scientist Sarah Karmel. As for Photocentric’s next steps? The company is now looking at metal 3D printing. While 3D printing in metal could eventually have a major impact on materials manufacturing, the 3D printing work that Photocentric is doing with metals is still mostly confined to the lab and is not a working solution just yet.